This is a lesson for a Weather ESL Quiz that will cover the water cycle, and include some storms that produce precipitation. Evaporation - Evaporation occurs when a liquid changes into a gas. Water that has collected in lakes, rivers, and oceans evaporate into the air in the form of water vapor, like steam. This happens as the temperature rises. Condensation - Condensation happens when the water vapor changes back into a liquid. This occurs as the temperature gets lower. You can see condensation on the outside of a glass of cool liquid during a warm day. Precipitation - Clouds form and the water vapor may fall back to earth as precipitation. Precipitation is water falling from the cloud to the ground. This happens when so much water has condensed, the clouds can't hold it any longer, and it falls to the ground as precipation. Blizzard - A storm with a lot of snow and very strong winds. Even after the snow has stopped falling, blizzard conditions may continue if the winds are still blowing the fallen snow into the air. Tornado - A spinning column of air with a funnel shape. These can be intense, dangerous storms that can cause much damage. Hurricane - A large spinning storm with winds over 74 miles per hour. These form over warm, tropical waters and can be devastating to people and property. Storms form when a warm front and a cold front meet. A cold front is the edge of a mass of cold air, and a warm front is the edge of a mass of warm air. Depending on the season and temperatures, the precipitation that falls may be rain, snow, sleet, or hail. Sometimes, you can see several of these during the same storm, especially in extreme storms. 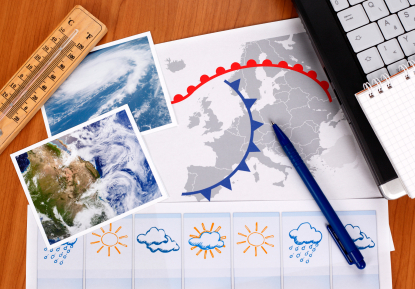 These are the terms that are key to understanding weather and that will typically be covered in a Weather ESL Quiz. 1. In what part of the water cycle does water vapor change into a liquid? 2. What kind of a storm has a funnel shape? 3. What kind of storm has a lot of snow? 5. What is a ball of frozen water? Here are the answers for the Weather ESL Quiz. "Weather ESL Quiz." YourDictionary, n.d. Web. 21 April 2019. <https://esl.yourdictionary.com/lesson-plans/weather-esl-quiz.html>.